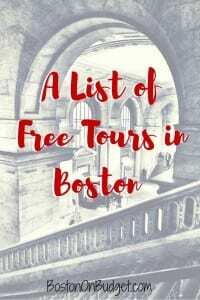 There are so many great tours in the Boston area and even better, there are a few tours of Boston that are FREE! Free tours of Boston is a great way to explore more of the city without spending too much money! Seeing the historic sites on the Freedom Trail is typically one of the top things to see in Boston while on Vacation. The Freedom Trail is a 2.5 mile, red-line route that leads to 16 historically significant sites. Some historic sites do charge an admission fee but many others are free or free by suggested donation. It is also free to walk along the Freedom Trail, and you don’t have to check out every attraction along the way. Pick up the red-painted trail anywhere in the city and print out a map of the Freedom Trail, and give yourself a free self-guided tour anytime. The Boston Public Library Central Branch location in Copley Square offers free architecture tours of the building. Free tours are offered daily by trained volunteer guides and last approximately one hour for parties smaller than 8 people. Tours begin from the McKim Building vestibule, through the library’s Dartmouth Street entrance. For parties of 8 or more people, please refer to information on private tours. For more information about BPL’s Free Architecture tours of the central branch, please head here. Enjoy a free tour of the Massachusetts State House! Free tours of the State House are Mondays-Fridays from 10-3PM, with no tours on holidays. Advance reservations are requested for conducted tours and you can call 617-727-3676 to arrange for a tour for groups from one to fifty people. For more information about free tours of the Massachusetts State House, please head here. Explore the Fort Point Channel and Boston Harborwalk with a free audio tour right on your iPod or media player. Walking time is roughly an hour and daylight self guided tours are recommended. These free walking tours are set to an original soundtrack of aquatic beats and rhythms and a great way to explore the water at your own pace. For more information and to download the Fort Channel audio tour, head here and head here for the Boston Harborwalk Audio Tour. The National Park Service offers free guided tours seasonally of some historic sites in Boston. Free tours are offered during the warmer months and usually require a free ticket reserved in advance. There are also free talks available year round and are available to any size group. Groups of 10 or more need to head to the reservation page before joining a tour or program. Take a free one-hour guided tour of the Boston Public Market to learn about their unique story, explore the space, and meet the makers of the Boston Public Market. To reserve a free tour, please e-mail Malia Maier, Marketing Coordinator at mmaier@bostonpublicmarket.org to schedule your Boston Public Market tour. For more information about free tours of the Boston Public Market, please head here. Enjoy free tours (with suggested donation of $2) of the Samuel Adams Brewery in Jamaica Plain and learn how Samuel Adams is made and receive free beer samples too! Free tours are Mondays-Saturdays from 10-3PM with Fridays tour ending at 5:30PM. Guests must be 21+ with ID (bring passport if outside US & Canada) to have samples on tour. Free tours depart every 40 minutes with no reservations available but arrive early in the day to avoid a long wait. For more information about free tours at the Sam Adams Brewery, please head here. Also, Don’t forget to check out the Boston Discount Attraction page for even more discounts and savings on tours in Boston and Ways to Save on Boston Duck Boat Tickets for discounts on one of the most popular tours in the city! 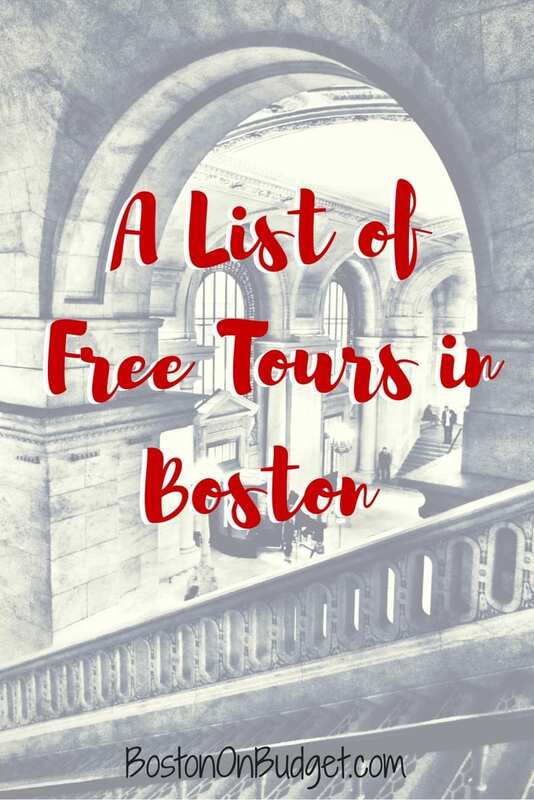 There are so many free tours in the City of Boston. Did I miss any? What is your favorite free tour in Boston? Kate, a fabulous free tour is the tour of the Deer Island water treatment facility. you pretty much have to have a car to get there, and you have to get a security clearance ahead of time, so some planning is needed (at least 10 days prior to taking the tour). I just did it last week and it was fascinating and there are beautiful views of the harbor from the facility.